Charles Robert Darwin (12 February 1809 – 19 April 1882) was an English naturalist and geologist, best known for his contributions to evolutionary theory. He established that all species of life have descended over time from common ancestors, and in a joint publication with Alfred Russel Wallace introduced his scientific theory that this branching pattern of evolution resulted from a process that he called natural selection, in which the struggle for existence has a similar effect to the artificial selection involved in selective breeding. He is honoured with a plaque, “which is fixed to the postbox outside Shrewsbury Library – where Charles Darwin attended as a schoolboy”, was unveiled to mark the 50th anniversary of Royal Mail Special Stamps programme. A stamp of Shropshire’s most famous son has been unveiled on a postbox in his home town. 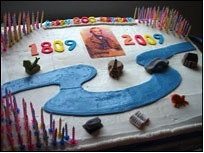 Already Darwin's 200th bicentennial birthday in 2009, has been celebrated in Shrewsbury with a giant cake with 200 candles, a tea party for children sharing Darwin's birthday, and a set of new Darwin Way markers, highlighting parts of Shrewsbury which were significant in Darwin's life (the article picture). Darwin was born at The Mount in Shrewsbury in 1809 and during his school years he developed the curiosity which proved crucial to his future as a scientist: "I was born a naturalist." On the Origin of Species was published in 1859, although he devised the theory of natural selection in 1838 following his voyage on HMS Beagle. During the journey he observed plants and animals all around the world. His book introduced the theories of natural selection and ultimately evolution. Here at Postbox Shop you can order a red postbox, but unfortunately it will not have the Charles Darwin Stamp Plaque on it. However take a look at our custom painted postbox range, you will not be disappointed! Everyone likes a bargain, so why not view our impressive ranges of postboxes in our SUMMER SALE too.